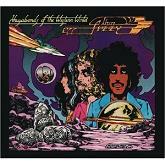 Review: "Thin Lizzy: Vagabonds of the Western World-Deluxe Edition (remaster)" - Sea of Tranquility - The Web Destination for Progressive Music! Classic Irish hard rockers Thin Lizzy normally are best remembered for their mid-late 70's output, such as the albums Jailbreak, Bad Reputation, Johnny the Fox, Fighting, and Live and Dangerous, but it's their third album Vagabonds of the Western World that actually bridged the gap from the band's beginning folk leanings to the more metallic sounds most of us came to associate with the group. The Decca Music Group has just unleashed this expanded Deluxe Edition of Vagabonds, completely remastered with a wealth of bonus tracks, info packed booklet, and a bonus CD filled with live BBC sessions from that same time period. If there isn't a better time to discover this album, I don't know when else that would be. Vagabonds of the Western World not only signaled the beginning of the hard rock Lizzy era, but also the end of their original trio of Phil Lynott (bass/vocals), Brian Downey (drums), and Eric Bell (guitars/vocals). Shortly after the release of the album, Bell packed it in, paving the way for the arrival of Scott Gorham & Brian Robertson, but that's a story for another day. This one is filled with blistering blues-rock, folky/psychedelic tinged numbers, and dark, moody, & atmospheric tracks that bridged rock and jazz influences into a hauntingly new sound. Bell has long been one of the most underrated players from the Thin Lizzy camp, and his raw, distortion dripping riff & lead work is all over cuts such as "The Rocker", "Mama Nature Said", "The Hero and the Madman", the dramatic title track, and the poignant "Little Girl in Bloom". A sign of things to come can be heard on "Gonna Creep Up on You", a dark, funky, heavy rocker complete with sizzling wah-wah licks from Bell and Lynott's menacing vocal, and "Slow Blues" is a must hear for fans of early Robin Trower, Johnny Winter, Pat Travers, and Ten Years After. Plenty of bonus material to be found on this edition, including the reggae flavored "Randolph's Tango", the heavy blues rock piece "Broken Dreams" (which reminds a bit of early period Nazareth), the funky "Cruising in the Lizzymobile", the heavy rock meets pop of "Sitamoia", and the great "Whiskey In the Jar".Over on CD2 you have a slew of BBC Radio versions of many of the main album cuts, as well as a few surprises, including a red-hot early rendition of "Suicide", which really helps to round out this wonderful package. The influence of Thin Lizzy is still being felt today, and one can only imagine how the history of rock would have been further shaped had Phil Lynott lived. For those who might have missed out on some of the early Lizzy back catalog, here's your chance to dive head first into the strongest of their first three releases.